When I created this summer salad, I was envisioning the corn on the cob sold by our neighborhood Mexican elote street vendors. “Elote” simply means “corn on the cob” in Spanish. The vendors traditionally serve the cobs coal-roasted with a squeeze of lime juice, slathered with (imitation) butter and mayonnaise, rolled in Cotija cheese and sprinkled with Ancho chile powder or cilantro. Sounds like overkill, but when done properly, they’re utterly addictive. For my salad version, I originally envisioned closely following the traditional list of ingredients, but since I was making this side dish for a sweltering June afternoon barbecue, I decided sunbaked mayonnaise may not be the best choice for a food-poisoning free day. My consternation then turned to cilantro. While I love the bright-green herb (especially on sandwiches and in salads), I realize there are many cilantro-haters out there, claiming it tastes like soap (others even asserting “cilantro allergies,” but color me doubtful.) Accordingly, I opted for the less-divisive dried Mexico oregano. The final recipe resembles nothing of Mexican street elote, but, nevertheless, it’s quite tasty and perfect for a summer backyard barbecue. No mayo, a breeze to make, and no need to refrigerate - the ideal side salad for a summer backyard barbecue. In a small bowl, whisk together olive oil, lime juice, garlic, pickled jalapeno, dried oregano, cumin, salt and pepper. Set aside. In a medium bowl, combine corn, red bell pepper, green onions, celery and Cotija cheese. Pour dressing over corn mixture and toss. Let rest for 30 minutes. Serve chilled or at room temperature. Tip: I roll leftovers of this flavorful salad in flour tortillas for an easy summer mid-week dinner. For July 4th, we had a casual Mexican fiesta dinner on the backyard patio. My guests brought guacamole and various salads. 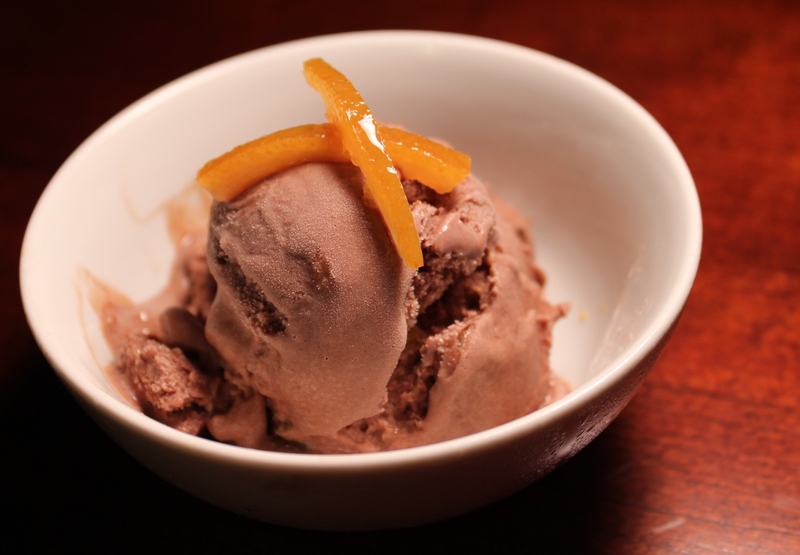 I braised a pork shoulder for deshebrada tacos and created two flavors of gelato –Toasted Almond Joy was my personal favorite. I’m chagrined to confess that I polished off the remainder yesterday. Sidetracked by the festivities, I forgot to take photos to share with you. Today, I used the leftover dibs and dabs secreted in the corners of refrigerator to create my version of Chilaquiles. Soak ancho chilies in hot water for 15 minutes. Seed and stem chilies. Blend both kinds of chilies, garlic, tomatillos and cilantro in a blender until smooth. Add ancho soaking liquid as needed if sauce is too thick. Add salt to taste. Set aside. Fry tortillas in oil, in batches, until almost crisp. Drain on paper towel and salt lightly. Remove most of the oil from the pan and sauté onion until soft and beginning to brown. Add sauce to pan and simmer until warm. Add tortillas and cover with sauce. Cook about 3-5 minutes until tortillas begin to soften but aren’t mushy. Top with queso fresco. Remove from heat. To gild the lily, top with a fried egg with runny yolk. Serves 4. I’m a planner, by trade as much as by nature. I’ve been in planning mode for my imminent Europe trip. After a plane change and two train rides, I’ll find myself in Northern Italy for a week of pasta school. School is followed by a week solo in Prague for exploring and, finally, one afternoon in Milan before heading home. I’ve created a few different guide maps for the trip – maps of the can’t-miss tourist sites, the must-visit restaurants, and, of course, maps of the local artigianale gelato shops, at least while I’m in Italy. My Italian gelato class in 2013 has converted me into a gelato elitist. This wait has become a countdown to exceptional gelato as much as a pasta school countdown. Let the trip begin. Cut tomatoes into wedges and cut wedges in half crosswise. Thinly slice celery and green onions. Dice cucumber and bell pepper. Drain and rinse beans. In a large bowl, combine beans and vegetables. In a small bowl, combine vinegar, salt, pepper and hot sauce. Slowly whisk in olive oil until combined. Pour dressing over vegetables, stir well and let marinate at least 30 minutes before serving.